Our friends from San Francisco were visiting for the holidays. One is a Wisconsin native and familiar with the Wisconsin fish fry, the other never experienced a fish fry, or even fresh water fish (i.e. perch or bluegill). They asked me to take them to a Classic Wisconsin Fish Fry experience because they follow my blog. I looked to my Top 5 list and decided it was time for another visit to my #1 favorite, Club Chalet Supper Club in Green Bay, WI. They wanted to eat early, so I made reservations at Club Chalet for 5 of us, at 5:00pm, right when they opened. We arrived a little before 5 and entered a small vestibule where we waited for the door to open precisely at 5:00pm. We found a pub table and got our drinks ordered at the bar, most of us enjoyed a brandy old fashioned. We were given our menus at the bar, and like a good Wisconsin supper club, our order was taken in the bar area. Because we had reservations, our waitress said our table would be ready with our salads in a minute or two, and it was. While our wait was minuscule, be forewarned that the place got busy quickly and you'll likely have an hour wait, it is a great supper club after all and long waits are to be expected for great food. The table was set as we remember from less than a year ago when we first dined at Club Chalet, our salads were set, a relish tray with an assortment of fresh vegetables, a cracker basket, and three spreads for the relish tray and crackers, including my favorite spread-liver pate-which had a mild flavor. All of us got both soup and salad with our meal, this establishment is one of the few places you will get both a salad and soup with your dinner. I got the seafood chowder and it was creamy and delicious, I loved the fact it wasn't too heavy with the cream, a perfect balance. After our salad and soup was finished, our meal was served. One in our party got the prime rib with lobster, and the lobster was a huge 14 oz tail. He enjoyed his prime rib and lobster very much. I got the perch dinner which included 5 full perch butterfly filets. The breading was light and the fish cooked perfectly, the perch was delicious and as I remember from our earlier visit. 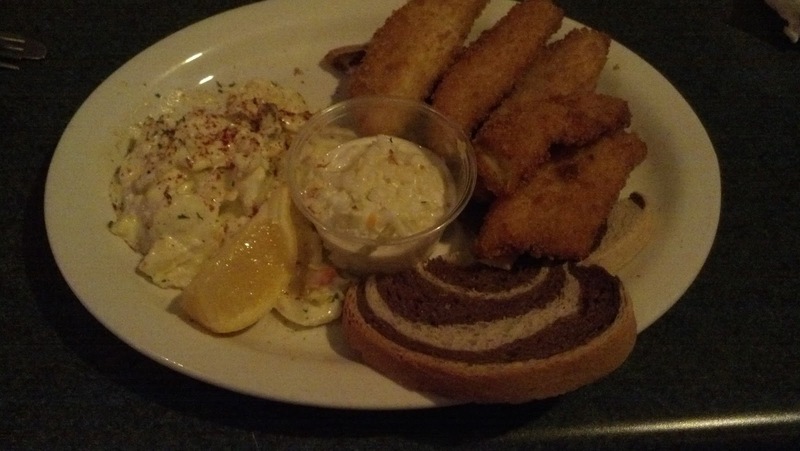 The fish was served with a homemade tartar sauce. There were several potato options but I remember the homemade potato wedges were the best cooked wedges I've found anywhere. I find most wedges to be too thick and dense, but these were crispy and delicious. A side of cole slaw was served with the meal, it was homemade and tasted good. The fish fry was complete with rye bread with a thick slab of white raw onion sandwiched between the two pieces of buttered bread. I asked the waitress if she knew the origins of serving white raw onion with rye bread and she said she would ask the kitchen staff. Their best guess was that onion was always cheap and readily available years ago, so it was added as an accompaniment for the rye bread. I do not know if this is the case, but it is the best possible explanation I have heard so far. Our San Francisco friends loved the experience from start to finish and thoroughly enjoyed their meals with us. For them, walking into an establishment with the ambiance of Club Chalet Supper Club may seem a bit backwoods with its medieval looking decor and chalet like structure, but they quickly learned this is the type of place you find great Wisconsin food and great Wisconsin traditions. This was our second time to Club Chalet Supper Club and we were not disappointed, and neither were our San Francisco friends. I am very happy that this place does not disappoint, is consistent with their food and service, and holds its rank as the #1 Classic Wisconsin Fish Fry experience in North East Wisconsin according to this blog. You absolutely must go, tell them Tom from the blog brandyoldfashioned.com sent you. You won't be disappointed! I've heard many people talk about Hotel Seymour over the years of how good it was and that we must go out of our way and check it out. We were here last year around Christmas time and at that time I was disappointed in the over priced food and lack of a good classic fish fry option. I was hesitant to go back this year, but as you'll read below, I was glad we did. Hotel Seymour has a bit of history, dating back to 1898 when it was built. Check out the website for more detailed information. I was interested in the mural on the wall picturing a bar full of patrons. The bartender said it was painted in the mid-1960's and depicts local regulars. She handed me a list with the name of each patron depicted on the mural, this list of names is also on the website. Here is a snapshot I took of part of the mural. There were 11 of us going for dinner, so we called in our reservations. We heard from years past that Hotel Seymour was a very busy place. It's hard to say when we checked in, we got there after most of our party was present, but our 7:15 reservation was pretty much honored. I didn't think the place was overly busy though, so being seated when we did seemed appropriate. Before we were seated we enjoyed a round of brandy old fashioneds. Much to my delight, they were hand muddled! We were handed menus at the bar for us to consider what we wanted, although our order was taken at our table. Notice they call their Friday special a "Traditional Fish Fry". We were about to find out if that held true. The service was alright. The waitress arrived to take our order and we said we needed a few more minutes, but it took quite a while for her to return. Maybe I'm being picky but I would have expected better, especially considering it didn't seem to be terribly busy. 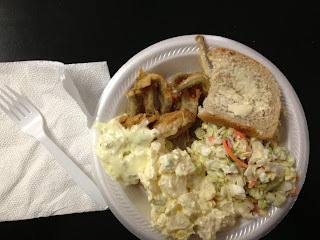 Many of us opted for the Traditional Fish Fry, and some got the seafood platter. There were an abundance of potato options to choose from, and we questioned our waitress whether the twice baked potatoes were made in house and based on her response, we were not sure they were. The salad bar was an additional $4.00 which I found to be quite pricey for a standard salad bar. It did have everything needed to make a good salad, including some pasta salads, breadsticks, homemade croutons, but it did not contain soup, notable sides (such as pickled gizzards), or even liver pate, something I would have expected for a salad bar costing $4.00. I chose not to include the salad bar in my meal, but others in our party did. On my perch platter, I received 5 perch filets, an odd number but I noticed other people in our party got 6, so they made a slight mistake. The perch was a tad thick on the breading and seemed inconsistent at times, but it was cooked nicely. The twice baked potato was delicious, but we were pretty sure they were not made in house. The cole slaw was good and nicely marinated. Our meal was topped off with rye bread, but no white raw onion. 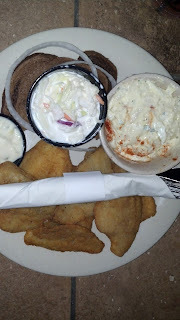 The tartar sauce was definitely homemade and had a strong pickle zing, something I enjoy in tartar sauce so I thought it was delicious. After our meal, we all decided for an after-dinner ice cream drink. Hotel Seymour offers options such as pink squirrel, brandy alexander, and grasshopper. The drinks were a bit light on the alcohol but were a good treat to finish off the night. Hotel Seymour turned things around in the last year and offers what I consider to be a reasonably priced Classic Wisconsin Fish Fry. I'd recommend it to anyone now, so go out of your way to Seymour and give their fish fry a chance, they have steak for the supper club crowd too so you can't go wrong. 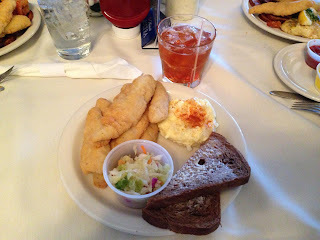 We were referred to Bourbon St Food & Spirits by a waiter at Chateau De Pere when we asked about local fish fry's while having a delicious dinner there. He mentioned they held a Friday fish fry for over 20 years so they probably know how to put on a good fish fry. We were pleased with the referral. Bourbon St Food & Spirits is best described as a dive bar. We walked into Bourbon St and to the right half of the building is the bar with bar stools, which were filled with patrons enjoying their cocktails. To the left is the dining room with a dozen or so tables. We were a bit confused at first because there was only one table of diners seated in the dining room and there were people at the bar waiting for the food. I think they have a small kitchen with one cook, and only one waitress, so they can only serve a small number of people at once. There were four in our party for the Bourbon St fish fry. Our total wait time from the time we arrived until the time our food came to the table was about one hour. We enjoyed a few brandy old fashioneds as we waited for our order to be taken then to be seated and served. An hour wait time is pretty standard for a good fish fry. Once we were seated our food came right out. Three of us got the perch platter, and one got the broiled haddock. They said the broiled haddock was cooker perfectly and was moist and delicious. The perch plate was laid out neatly with each portion partitioned from the others. The perch was stacked with each layer criss crossing the layer below it for a total of 6 pieces. The perch was lightly breaded and cooked wonderfully, it is always great to taste perch that's cooked properly. Two of us got the french fries for the potato and two of us got the homemade potato salad. The fries were cooked nicely and had a nice crispiness to them. The homemade potato salad tasted great. The meal included coleslaw and it had a good flavor to it. The plate was complete with rye bread and a thick slice of onion to top it off. Overall, we were very pleased with our service and especially the food. Even though they only turn one to two tables at a time, it was a good classic Wisconsin fish fry. I think if they focused on turning tables and serving more patrons, they could have a very popular fish fry, they already know how to serve a good perch platter. If you're looking for a quiet local bar setting to enjoy a great fish fry, Bourbon St is a fish fry to check out. The Skyview Club was on our short list for some time, and we finally got the opportunity to check it out. We were pleased with the food, but not with the service. We arrived at 6:30pm with four in our party, we put our name in with the host and headed for the bar. The bar area was quite crowded, which didn't surprise me much. We got our brandy old fashioneds, not muddled, and they tasted fine. Skyview Club is one of the few establishments to have their drink tumblers branded with their name, a good idea if you ask me. We knew it would be a decent wait so we asked to order some appetizers and decided on the jalapeno poppers and cheese curds. We got them in a short amount of time and they were fried nicely and we enjoyed them. A few people didn't realize you could order appetizers at the bar because it wasn't advertised, something Skyview Club could advertise while people were waiting. After about 15 minutes the waitress came around to take our order. I was thinking how fast we would get to eat, but unfortunately it was another 45 minutes before we were called into the dining room. We were glad we got the appetizers to tide us over after all. It was a full hour before we were called into the dining room from the time we arrived, and such a wait is not uncommon for a good fish fry establishment, especially a supper club like the Skyview Club. We were seated at our table, but there was no food or glasses of water in sight. We were seated and our waitress disappeared. It was a full 10 minutes until our food was finally brought out. This is one of the reasons I say the service needs improvement, don't seat us at our table without having the food either sitting there or coming out immediately after being seated (remember they took our order at the bar). I was also disappointed that the waitress didn't ask if we needed water or any other beverages, especially as we waited for our food. We had to flag down a passing waitress to get water and she seemed agitated that we stopped her. There were several waitresses sprinting around the room in such a rush, seemed they were just seating people and dropping off food and not checking on the customers very much. But we finally had our food, I was happy to see the meal came with rye bread, but the portion size was terribly small, and it did not include raw onion. The potato salad I chose as my side was good, nothing great, as was the cole slaw. But the perch! The perch was excellent! I very much enjoyed the perch and would recommend it to anyone. It was nicely breaded and cooked to perfection. It was a nice bonus to an otherwise good meal and poor service. I thought Skyview Club was ok only because the perch was so good. The service was bad enough I am not sure I want to go back. 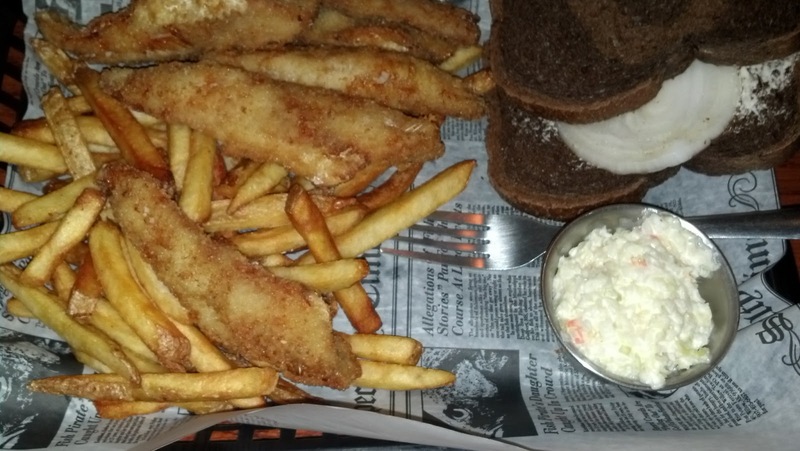 If you're looking for a good fish fry and don't care about the service, they just might be worth a visit for the perch. Potato: 1 point, served with choice of potato -- the loaded baked potato option was AWESOME! 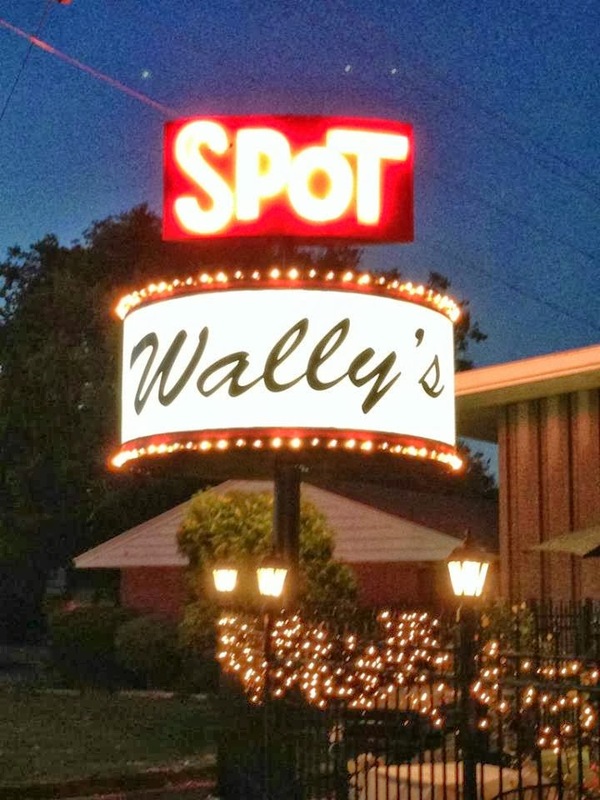 Wally's Spot Supper Club in Green Bay has been on our list for quite some time. For years we've driven by to see the neon lighted sign rotating like a spot on the Las Vegas strip. We finally made it and I was glad we did! 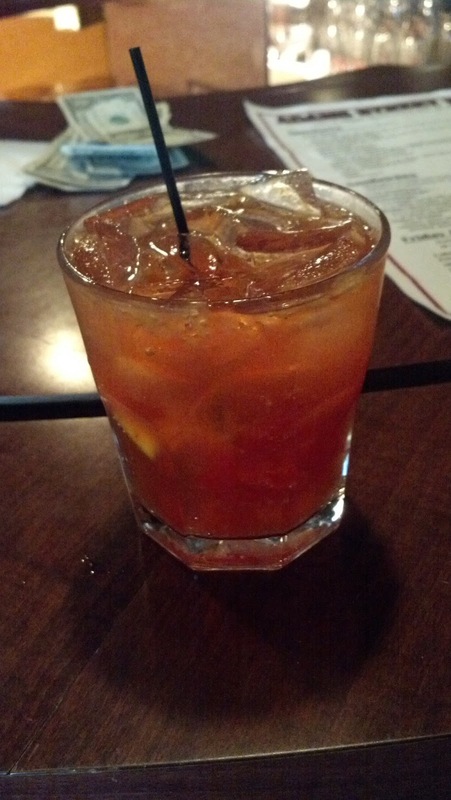 There were 6 of us meeting for dinner, but we were the first to arrive so we started on our brandy old fashioneds. When we arrived at 7:00pm, we could have gotten immediate seating because there were open tables. The brandy old fashioneds were not muddled but were mixed well. Our friends arrived about 7:30 and we then put our name in and enjoyed another round of drinks until the waitress came with our menus. The waitress handed out menus at the bar and took our order, it is a supper club after all. We were assigned our table and made our way to the salad bar. The salad bar was all salad items and didn't have side items, but I made myself a delicious salad with all the fresh ingredients. At the table, the water glasses each had a cucumber slice, a nice touch. We were finishing our salads and the waitress came out with a small appetizer, compliments of the chef. It was a pork tendorloin with a cherry glaze. It was nothing spectacular but a surprise for a supper club. Our food took a while but eventually made its way to our table. I got the perch platter, friends got the seafood platter, and walleye. The perch was cooked nicely, had a light breading, and was crisp and delicious, probably the best perch I've had in a while. I opted for the fries which were cooked nicely. I didn't have the cole slaw, but it was available on the salad bar. And I was excited to see the rye bread served with raw onion. My friends who got the seafood platter said it was good, the baked cod was the best part. Another got the pan fried walleye and that was really good. While I chose the fries as my potato, some of my friends got the loaded twice baked potato special (for $1.50 more). I had a taste and I have to say I haven't had such a delicious (and 100% real potato) ever. Kudos to Wally's Spot for making such a great twice baked potato served in the potato skin. The meal was completed with a complimentary scoop of orange sherbert, a great way to end our dinner. 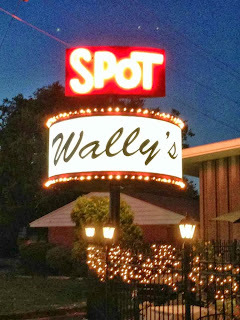 We finally made it to Wally's Spot Supper Club and we were impressed and walked away very satisfied. Next Friday, you need to check it out and put if on your short list for Classic Wisconsin Fish Fry's. I'm putting Wally's Spot as #2 on the top 5 Classic Wisconsin Fish Fry's in North East Wisconsin. Now that's saying something! Classic Wisconsin Fish Fry Scale: 4 points out of 5, almost a classic Wisconsin fish fry. I first have to apologize for the lack of posts over the past two months. Mid-summer got busy and we are finally getting time to enjoy a local Friday fish fry. 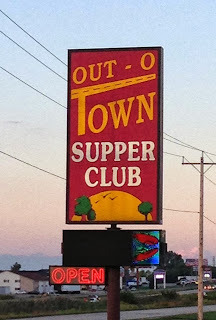 On our list for a while was a local favorite, the Out-O-Town Club in Kaukauna. We arrived around 6:30pm and put our name in. We had 2 more friends joining us and we were able to find a table to seat us in the bar in a short amount of time. We only had a 45 minute wait, and for anyone who has been to the Out-O-Town Club, that isn't too bad. During that time, we got a few brandy old fashioneds, while they weren't muddled, they were well mixed and came with a healthy serving of garnishes. Like any good supper club, a waitress presented our menus in the bar area then came back to take our order. Two of us got the perch platter, one got a tenderloin with stuffed shrimp, and one got the seafood platter. The perch platters did not include a salad bar but we added it on for an additional $2.00. The Out-O-Town Club has a great salad bar so we went to our table in the dining room and approached the salad bar. My two favorite things they offered, and that I thoroughly enjoy are pickled gizzards and liver pate. The pickled gizzards were delicious, but the liver pate was nothing that great. But the salad bar offers a pretty good variety to choose from. Bread and cole slaw were served family style for everyone at the table. Food came out in a timely manner. The presentation was perfect and my fish was lightly breaded and fried golden brown; you could see the fish through the breading which is always a good sign the breading is not too thick. The fish was just about perfect and was delicious. I opted for a side of potato salad, it was a bit bland but was good. The cole slaw was a creamy variety and it was good. I was disappointed that the rye bread was a light rye and did not include white raw onion. My friends enjoyed there meals. The one who got the tenderloin commented that it was one of the better steaks he has had in a restaurant. It was cooked to perfection and was a healthy portion. We were a bit disappointed though in the mashed potatoes stuffed with cheese and mushrooms, they seemed almost like a twice baked potato but seemed to be fake potatoes, not something I would have expected from Out-O-Town Club. 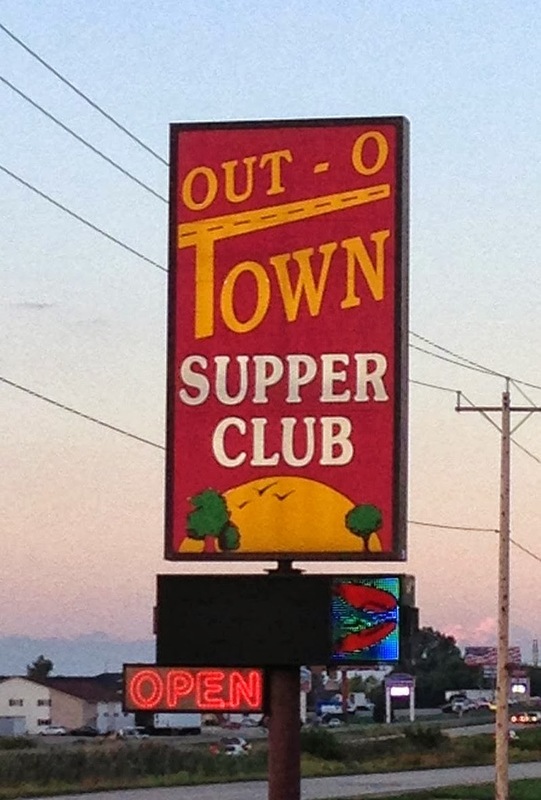 The food, service, and atmosphere were all good, just as I remember the Out-O-Town Club. They have most of the components of a classic Wisconsin fish fry and a great supper club experience as well, definitely worth a visit. The Settlement has been on my list of fish fries to try because it seems like a popular establishment for a great fish fry. So he headed past the east side of Green Bay to the country to check it out. We walk into The Settlement, the bar was on our left and a small dining room was on the right. The bar area was larger than the dining room. It was just two of us initially but some friends happened to be there as well so we put our parties together and got a table of 8. To start, we ordered some appetizers of mushrooms and cheese curds since it was going to be a bit of a wait. With a party of 8 and a popular fish fry, we expected to wait a while. The appetizers were good but some were slightly undercooked, but it took care of the immediate hunger. In classic supper club fashion, our orders were taken in the bar area and our table was set with the food before we were called to the dining room. Some of us got the perch platter, some got the seafood platter, some got the cod, I of course was one who got the perch platter. I was hungry so I opted for the double perch platter, and The Settlement is know for generous portions so I had more than enough to take home with me. I got 6 perch for a total of 12 filets! The perch was good, breading was just about right but a tad on the thick side. A variety of potato sides were offered and the fries are known to be good but I couldn't pass up their special of the night of homemade cheesy au gratin potatoes. I felt like they loaded the plate with way too many potatoes, but maybe that is what you get when you order a double order. They were ok, a bit too cheesy for my taste. A side of cole slaw was served as a standard size, nothing special for cole slaw, it was good. The meal came with rye bread but no raw onion, so I asked if I could have a slice, for some reason I love the raw onion with the rye bread. The Settlement is a popular fish fry establishment, when you go expect to wait for a table no matter how small of large your party is. 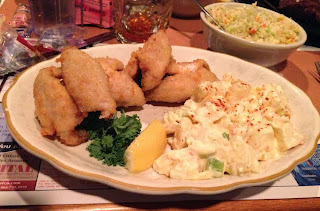 The food was good and has most of the components of the classic Wisconsin fish fry. I liked the fact that many people who work there are family, so its a family run operation and I like to support that. Krabbe's is a bit out in the country in Seymour that my friends thought we could try. We come to an intersection in the country, farm fields all around, a farm across the road, and there sits Krabbe's Kountry Klub. The place has an old classic country club feel, dim lighting, cushy leather bar stools, and an open dining room with numbered tables. We put our name in, but by the time we got here at 8:30pm the dining room was cleared out and there was plenty of room at the bar. We ordered our brandy old fashioneds and I asked the bartender if they use their own mix and he assured me they did, and he was the owner. We were hungry and spotted cheese curds on the menu so we ordered a basket-they were hand breaded and delicious. In classic country club fashion, our order was taken at the bar. I ordered the perch platter and my friends ordered some variation of the seafood platters. Salad bar was included with the meal and we were offered the option of adding a cup of homemade soup for a buck. We were seated and our soup was brought out as we were enjoying the salad bar. I had the homemade french onion soup, it was good but nothing fantastic. Salad bar had a good selection so I enjoyed some pasta salads, a small salad, and crackers with the liver pate. I love a good liver pate, typically preferring the darker variety, Krabbe's offered a lighter colored and the flavor wasn't as strong as I would have liked. Our food came soon thereafter, I was excited to try the perch platter because the perch was hand breaded. The platter was $16.95, pricey by fish fry standards, and that came with 6 pieces of perch, a potato for a side, a bread basket, and the salad bar, but soup was extra. The perch was breaded a touch on the heavy side but not too bad, it was good. I chose the twice baked potato for my side and that was good as well. Nothing fantastic but good food overall. The bread basket didn't include rye bread and none was served with the meal, so I was bummed about that. If you're looking for a supper club experience with good food, check out Krabbe's Kountry Klub. But if you're looking for a Klassic Wisconsin Fish Fry, this might not be the place for you. We were looking for a low key fish fry, and thought we would check out Fox Harbor Pub and Grill on the water in Green Bay. This establishment is great for docking your boat and coming in for lunch or dinner, and they offer a pub experience and a Friday Fish Fry. We headed to the patio and ordered a cocktail at the bar, what else but a brandy old fashioned. I was delighted when they started adding the cherries, sugar, orange peel, and bitters and hand muddled it. The drink had a great flavor and I was pleased. We were going to sit on the patio but it was a tad chilly this late at night so we headed inside and grabbed a pub table. It was 8:30pm when we got there and there were only two of us and plenty of seating options available. 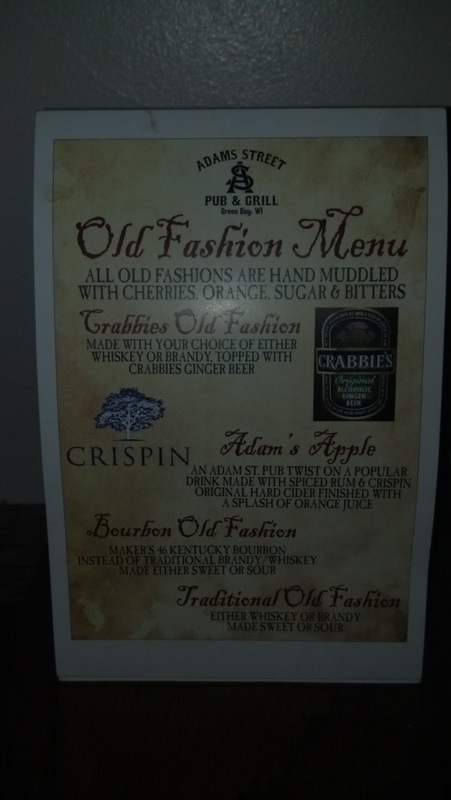 The menu included all sorts of pub options like burgers and wraps and had a Friday night specials on the back. I debated on the perch or blue gill but decided to go with the blue gill. I prefer a well prepared blue gill usually. We started off with fried mac & cheese bites. They were served with fries and I must say they were pretty tasty. We ordered our main course right after we ordered the appetizer and our main course was delivered with lightning speed; we were still working on our appetizer. I got about 6 pieces of blue gill. I was thinking they were going to be butterfly but instead were individual pieces. The breading was a bit thick for my liking but it was good overall. For a side I got a choice of fries or potato salad so I opted for the potato salad which was good. The menu read they serve up the fish fry with their own homemade cole slaw. The slaw was a creamy variety and had a good flavor to it. Finally, the classic Wisconsin fish fry was completed with rye bread with white raw onion. I was impressed they scored a 5 out of 5 on the scale. The only complaint I had is they seriously skimped on the onion, I got two strands of onion instead of a full slice. At Fox Harbor Pub and Grill the food is your typical pub offerings. It's a great place for a laid back lunch or dinner and I was happy they scored a 5 out of 5 on the classic Wisconsin fish fry scale. My friends wanted to go to Graystone Ale House, and I'll be honest that I wasn't expecting much. We got there around 8:00pm and seated ourselves at the bar, the tables were mostly empty. 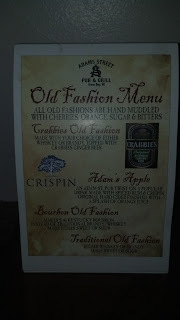 I ordered my brandy old fashioned sweet, and to my surprise they started adding in the ingredients and muddling it up. At this point, my friends saw that it was muddled and decided they wanted one too. The drink was great, perfect blent of fruit, bitters, sugar, and of course brandy. They offered a Friday night fish menu that included lake perch, mahi mahi, grouper and some other seafood options. This was in addition to their regular menu and their summer seasonal menu. I ordered the butterfly lake perch for $12.45. My friends all got something different besides the fish, they offer an excellent summer menu with salad sandwiches that were really good. Food came out quick enough, I got 3 butterflies of perch for a total of 6 pieces. The breading was a little thicker than I like but it was seasoned well. The dinner automatically came with french fries which were crispy and pretty good. Cole slaw was a creamy variety but wasn't anything special. On the side of my plate was the rye bread, and I didn't think there was any onion on it because it looked pretty flat. I peeled off the top piece and it was buttered well and had a small slice of red raw onion. Now I'll say that I much prefer white raw onion (and still researching the history on that), but I had to give them a full point for offering the rye bread with raw onion, probably my favorite part of a classic Wisconsin fish fry I must say. I came to the Graystone Ale House with low expectations but left satisfied, and was especially satisfied that they got a 5 out of 5 on the classic Wisconsin fish fry scale. It's worth a visit! We were down in Oshkosh for the Memorial Day Weekend, so we wanted to check out a local fish fry. Vinland Still N Grill is a local establishment serving up good food and good drinks in a pub setting, and the occasional band. We arrived at 7:00pm and were able to get immediate seating and cocktails. 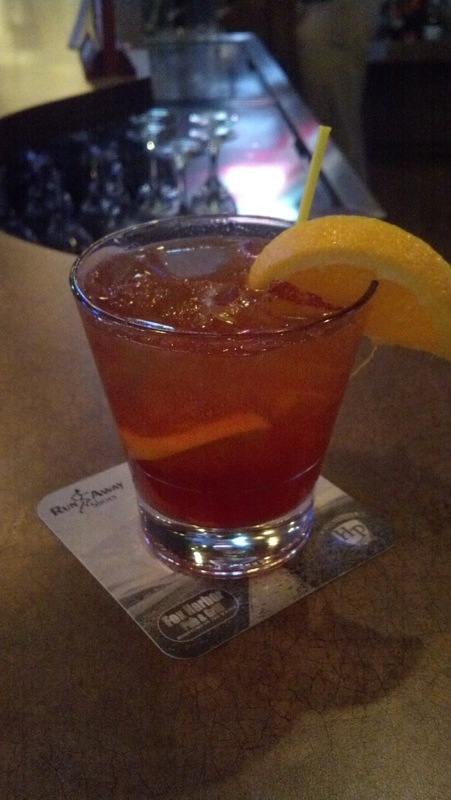 The brandy old fashioned sweet wasn't muddled and was from a standard mix, but it was tasty. They offer $3.50 rail brandy old fashioneds on Friday nights. We started with appetizers of onion rings and mushrooms. The onion rings were really good, and we had breaded portabella mushrooms that were excellent! I would definitely recommend the mushrooms. 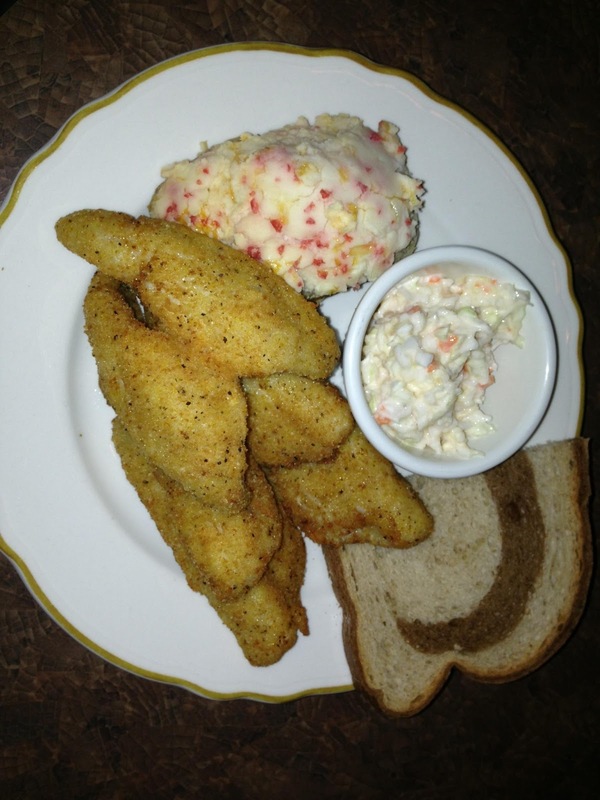 The fresh lake perch dinner was $13.00 (6 pieces of fish). They also offer a smaller portion for $11.00 and a jumbo portion for $15.00. The fish was pretty good with a nice tasting breading; the breading was a litter thicker than I like but it was seasoned well. I got twice baked potato on the side, it was served in a potato skin and I'm pretty sure it was homemade and it was good. The cole slaw was a creamy variety, also good. Marble rye bread was served with the meal, but no raw onion. If you're in Oshkosh, check out Vinland Still N Grill. 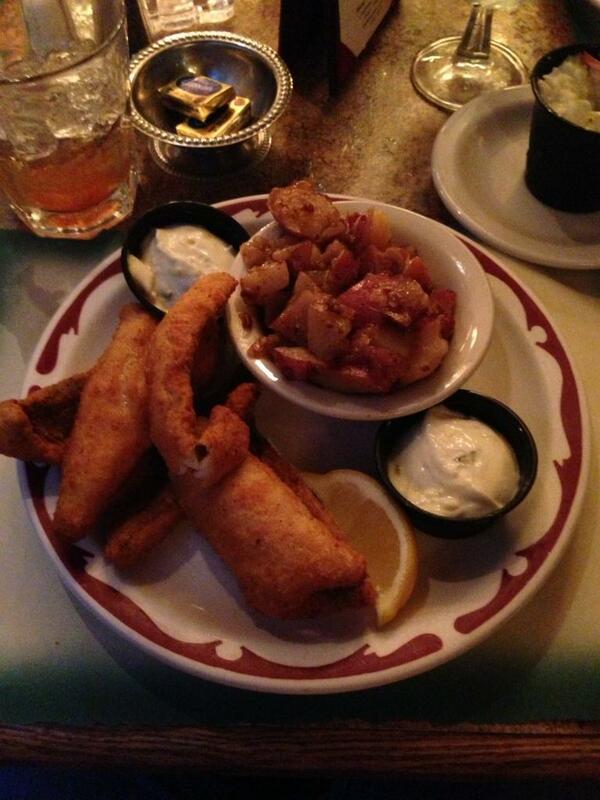 With 4 out of 5 points and good food, this definitely qualifies as a Classic Wisconsin Fish Fry. When a coworker told me of Adams Street Pub & Grill, and the fact they had hand crafted cocktails and fish fry, we had to check it out. Its hard to find estabilshments that take the time to hand craft their cocktails, and this is one of them so I was excited. There were 4 of us planning for fish, and our friends got their first. They text us saying there was only one other party eating fish, the rest of the patrons were there for drinks and socializing. We arrived and it was 7:00pm, and given no one was really eating fish there was no wait for a table. We ordered our brandy old fashioned sweets, and the bartender took to muddling our drink and serving it up. The drink was good as I expect from a hand muddled cocktail. We ordered a sampler basket at the bar. It included cheese curds, jalapeno cheese curds, fried jalapenos and some other things. It was an interesting sampler platter and was overwhelmingly jalapeno based. We eventually ordered our fish, I got the perch platter and my friends got the seafood platter. There was no choice of a potato, it was automatically served with french fries. Our food came promptly and I was excited to see that this is the first establishment to meet all 5 criteria for a classic Wisconsin fish fry. They had a lake perch, french fries, coleslaw, and rye bread with white raw onion. With the hand crafted cocktail, I give this establishment my first 5 out of 5 points and consider this a true classic Wisconsin fish fry score. The food was alright, I would consider it ok. This is a pub and they serve all fried food, this is the reason only french fries were offered for a potato. The fish was crispy and ok, it wasn't bad at all. The fries were good, a little greasy. The coleslaw was a creamy variety and was pretty good. And the rye bread with white raw onion was good, its hard not to be good with such a simple side. All this was served in a basket lined with newspaper print paper. I was surprised to see there wasn't anyone else eating here, I expected the place to be busier. I suppose not many people think to go to downtown Green Bay for a fish fry. The hand crafted cocktails should draw people in and I think it is worth a visit just for that. Classic Wisconsin Fish Fry Scale: 3.5 points out of 5, a classic Wisconsin fish fry. We arrived at 7:00pm and it looked like the parking lot had some open spots so it wasn't going to be too busy. We put our name in for our party of 3 and were told it would be about 45 minutes for a table. We headed to the bar, there was plenty of seating available, and we ordered our first round of brandy old fashioned sweets. While it wasn't muddled, it was of their own custom mix so that was good to hear. We were quite hungry so we placed an order for their homemade vidalia onion rings with chipotle mayo. The onion rings and dipping sauce were fantastic, it was a great appetizer as we waited for our table. After about 30 minutes we were invited into the dining room as our table was ready. I got the perch platter with a side of the german potato salad. My friends got the all-u-can-eat haddock and one got the baked stuffed haddock. After we placed our order, the waitress delivered a breadbasket to our table with homemade rolls. It was a nice touch that the butter she delivered was room temperature and easily spreadable. It is often the case the butter packets come straight from the fridge and are rock hard, Mark's East Side seems to pay attention to the little things. Next up was the coleslaw. I found it a bit odd our waitress brought the coleslaw cups out ahead of time and set them in front of us as if they were a salad. The coleslaw was a creamy variety and had a good flavor to it. The fish followed shortly after we got our coleslaw. I got 6 pieces of perch and it was fried golden brown, breading was light, and you could see the fish through the batter. I always say if you can see the fish through the batter the breading is just about perfect. The German potato salad was excellent and it's hard to find a place that beats Mark's East Side. The tartar sauce was homemade and great for dipping the fish in. My friends haddock, both fried and stuffed baked were equally delicious. It's a great compliment to a fish fry establishment when all the meals at the table tasted excellent. 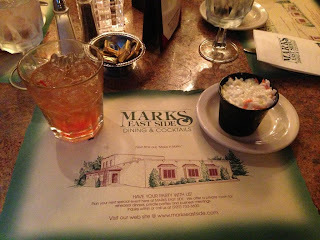 I've only been to Mark's East Side a few times but every time the food and service is consistent and spot on. At 4 out of 5 points on the Classic Wisconsin Fish Fry scale, they serve a classic fish fry experience, delicious food, and also offer the supper club experience. You must check this place out. It was time to try a fish fry in my hometown, so Hilly Haven was on the list. Hilly Haven is a golf course, but they also have a full service restaurant and grill serving food daily, including a Friday Fish Fry and a delicious Sunday brunch. There were 4 in our party and our friends got their first. They started on their orders of Brandy Old Fashioned as they waited for us because we were late. We got there around 6:45 and got our own cocktails and had some time to chat. The brandy old fashioned was not muddled and was your standard cocktail. The restaurant was only half full so there was no real wait, just had to tell the host when we were ready. We were seated at our table and looked over the menu. They offer several fresh water fish options including perch, walleye, and bluegill. I was tempted with the bluegill but opted for the perch instead. My friends all ordered the seafood combo and I ordered the large perch platter for $15.95. Our meal came in a timely manner. I received 6 pieces of perch on the large platter, the regular platter would have come with 4. I opted for a side of potato salad, and the meal came with a cole slaw and buttered rye bread, but no raw onion. The fish was good, maybe a little too much breading but it still tasted good. The potato salad was tasty and I loved the vinegar based cole slaw. The rye bread was what you'd expect from rye bread, but I was disappointed it did not come with white raw onion. I was delighted to learn our meal came with a complimentary grasshopper, so that was a nice treat to finish off our dining experience. The atmosphere was clean, the service was friendly, and the food was good. I'm surprised more people don't come out for this fish fry. I wonder if people think of Hilly Haven as just a golf course, but they are worth a visit for their Friday Fish Fry. I've been here for their Sunday brunch and they put on a concise, yet delicious spread of freshly prepared foods, that is also worth a visit! Highland Howie's is located East of Green Bay out in the country. Coming up on the establishment, it looks like an old Victorian house converted to a restaurant. I've learned there is another Highland Howie's located in Suamico, I'm not sure if they are related in any way, but I've heard the experiences are quite different. We walked in to a large bar area with pub tables throughout. I figured this was just the bar area, but it was also the main eating area too. We put our name in and told it would be up to a 1 hour and 30 minute wait, but the bar didn't feel that crowded so it was nice to have room to drink and chat with friends. We had 10 in our party so the wait for a busy establishment is not unheard of. We approached the bar and started ordering our round of drinks. Some of us got a brandy old fashioned, including myself, and others got their drink of choice. The drink wasn't muddled but was tasty and hit the spot. We had a few more rounds before they informed us our table was ready, after barely an hour wait. We made our way to our pub table and checked out the menu. We made sure to order 2 baskets of cheese curds with fries to get some food in our bellies. The cheese curds were a little greasy but quite delicious. Many of us ordered the perch platter for a market price of $12.95. The food came out fairly quick after we ordered. The perch platter came with 5 pieces of breaded perch. I got the potato salad with mine but fries and baked potato were other options. A helping of cole slaw and rye bread were served with the meal, but no raw onion. I was delighted to learn they had homemade tartar sauce. The fish was crispy and good. The potato salad was fine, a little on the harder side but definitely edible. The cole slaw was a creamy variety and also tasted good. I asked the waitress why they didn't serve raw onion with the rye bread and she said they never did and she hadn't heard of that. This kicked off a debate on whether raw onion is a classic accompaniment to rye bread, and if it was should it be a red or white onion. The waitress brought out some raw white onion to satisfy our craving. I plan to do some research on this topic and will post my findings. 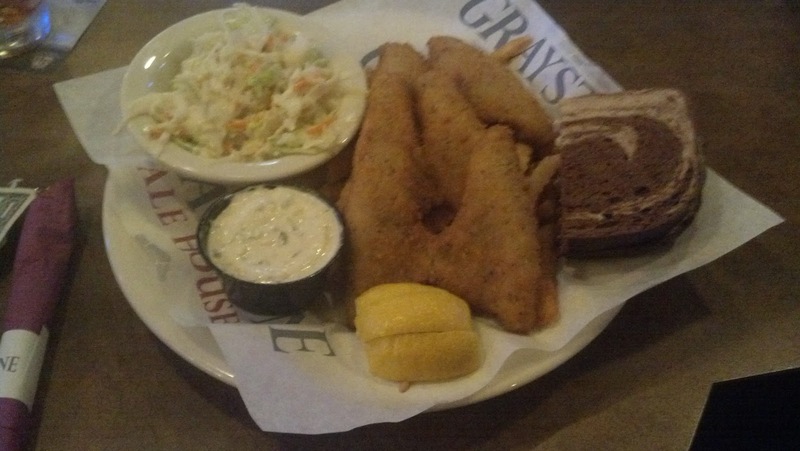 All in all, Highland Howies is a place to go for a classic Wisconsin fish fry, but expect to wait for a table. But waiting for a table means the place is busy and usually has pretty good food. End of March and early April is when the smelt run, a small freshwater fish caught with nets on the piers of Lake Michigan and some streams. Look around Wisconsin and you'll find a variety of smelt fries that are a once a year occurrence. Rocky Top in Greenleaf, WI hosts their smelt fry around the beginning of April, and its a nice reminder that spring is here. Their smelt fry was on a Thursday night so it technically isn't a Friday fish fry, but it is a classic Wisconsin fish fry experience nonetheless. The signs around town indicates it starts at 4:00pm and goes until the smelt runs out, which varies each year so its best to get their early. Last year they were sold out at 6:00pm! Rocky Top is out in the country at the intersections of Hill Rd and St. Pat's Church Road and all the roads were lined with cars when we arrived. We walked into the bar and got a drink and took our place in a long line. Guys in line talked about some years where the line went out the door and down the road a bit. This year we thankfully found a spot in line and didn't have to wait too long. In fact, they get so busy they setup a drive through lane kitty corner from the bar near the Askeaton town hall and ball diamond for people to pick up and take their smelt home with them to enjoy if they didn't want to find a table in the bar or dining areas. You pay $10.00 and get your hand marked with a black marker. The line seemed long but moved quickly. The smelt was fried right behind the table it was served on so you could watch the guys do the breading and frying. You served yourself so you could have as much or as little as you want. Further up the line past the smelt there was potato salad and cole slaw, and light rye bread both buttered and unbuttered. They also included a bar, cake, or cookie for dessert. It was all you can eat so you could skip the line to get seconds. Everything about the experience was good and I need to mark my calendar for next year for this once a year local event. I should have posted something before it was taking place but we'll do that for you next year. This is what classic Wisconsin fish fry's are all about.